Before selling a commercial property in Massachusetts, there are several steps that you can take to maximize its value and your return on investment. Below are a few key tasks to keep in mind. First impressions are everything! Discerning buyers will look for signs of how the building has been maintained over the years. Take the time to stage your commercial property to maximize its appeal and eliminate any red flags for potential buyers. Improving the aesthetic of a building is a short-term expense that can lead to high returns. Having professionals come in and repair or maintain major systems will be benefit you in many ways. First, it allows you to address minor problems before they become major ones. Secondly, it reduces the likelihood of price negotiations after buyer inspections. Thirdly, providing such information to potential buyers can increase the appeal of the property by lessening buyer concerns over system issues. These are all helpful to your ultimate bottom line. Buyers will perform due diligence and request various documentation. This may include tenant history, leases, financial statements, and more. Take the time to gather these documents ahead of time. This will expedite the sale process and avoid unnecessary delays. The buyer, real estate agent, lawyer and all other parties involved will appreciate your forethought and diligence. 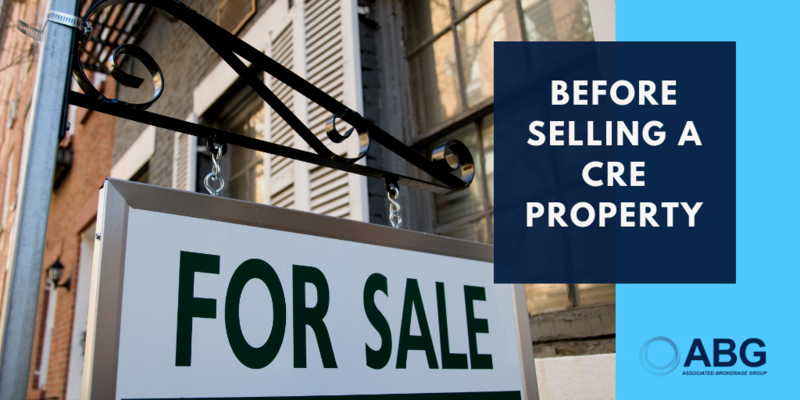 Once you have prepared your building for sale, seek professional help to gain maximum market exposure. Commercial real estate brokerage firms, like ABG Realty, have networks of potential buyers and the resources to market your listing to the widest audience. Your agent will also provide valuable fiduciary duties to protect your interests and achieve a successful closing. Contact us today to schedule your complimentary consultation.